Upholstery cleaning is a delicate situation. You can’t just trust anyone or yourself to clean your upholstery. There are so many risks from ruining the upholstery by over soaking it or stiffening the cushions or not efficiently cleaning the furniture. There are just too many risks which is why you should hire a pro you can trust to clean your upholstery. A professional steam clean must use a low PSI when cleaning upholstery. If they use too much pressure you will have too much water which can lead to the growth of mold and mildew. 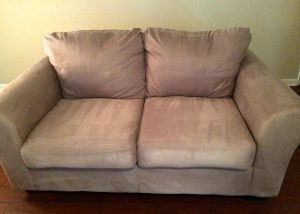 If too much water is used it is nearly impossible to extract all the water out of a sofa cushion or mattress. 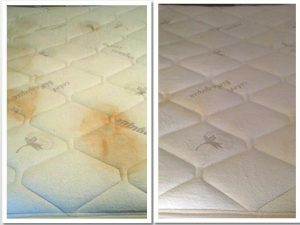 The excess water will not only lead to mold and mildew it can also leave water stains on the surface discoloring the fabric. If you use a DIY machine these often use soap and water which is harsh and will cause stiffening of the furniture and will leave residue behind. The residue left will attract dirt causing your furniture to become dirty quicker. 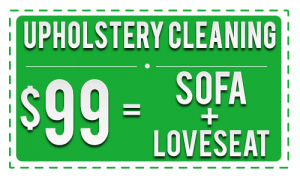 Beyer Carpet Cleaning is unbeatable when it comes to upholstery cleaning. They use the proper equipment and products to sanitize and remove any spots or stains from your upholstery. They always use a low PSI to ensure that they don’t over water your upholstery and to ensure no unwanted growths of mold or mildew appear. No residue is left behind to attract dirt because Beyer Carpet Cleaning uses enzyme and emulsifier solvents to clean. They extract as much water as possible to ensure nothing is left in the cushion. Beyer also offers a quick dry method so your upholstery cleaning will dry in less time lowering the risk of any water damage. Beyer Carpet Cleaning stands by all their upholstery cleanings so if you are unsatisfied you don’t have to pay until you are. Beyer Carpet Cleaning knows how important it is to make sure all their upholstery cleanings are done right so they don’t take any chances. So wether it’s sofas you need cleaned or mattresses or vehicle interiors Beyer Carpet Cleaning is your upholstery cleaning expert!